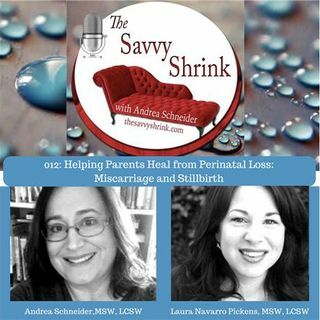 The Savvy Shrink podcast is honored to have Laura Navarro Pickens, LCSW as our guest today. Laura brings with her decades of clinical practice helping families in the aftermath of perinatal loss, including stillbirth and miscarriage, as well as birth trauma, infertility, and postpartum adjustment. Today's podcast focuses on how parents can heal psychologically when the absolute worst nightmare occurs, and they lose a pregnancy or a beloved infant . Listen in as Laura shares her expertise ... See More in knowing how to support families with this very specific form of traumatic loss. Currently, Laura provides consultation services to the Kendall Lauren Honig Pregnancy & Infant Loss Program at Hoag Hospital, Newport Beach, where I also facilitate their weekly Perinatal Loss Support Group. She is a psychotherapist for Orange County Community Services Programs, Inc (CSP) - Victim Services. I also facilitate a weekly Parent Support Group for parents whose children have been victimized by crime.